Buena Nota can have a lot of different meanings depending on the context. “Good grade” is one of the more common translations, but it can also mean “a well-played note”. In Costa Rica – the country where we first got started as a company – it’s a phrase that can be used when thanking someone or paying a compliment. To us, Buena Nota means quality. We partner with Costa Rican growers to bring you the finest in fine flavor cocoa beans – exceptional ingredients worthy of the effort and artistry that go into craft chocolate-making. Our goal is to provide a burgeoning fine chocolate industry with delicious, responsibly-sourced cocoa, all while helping to improve conditions in the countries where cocoa is grown. Wholesale pricing and samples for our products are available upon request. 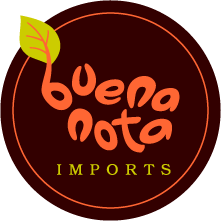 Just send an email to sales@buenanotaimports.com. We are always working to expand our existing product line, so please don’t hesitate to contact us if you’re interested in becoming one of our suppliers.